Our large shed flower box is perfect for amplifying the aesthetics of your new shed. With durable construction, our shed window box is perfect for outdoor sheds and storage buildings. 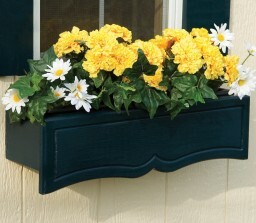 Add a window box to any shed with easy set up, then plant your favorite flowers! Our flower boxes come in two sizes; we have a larger version and a smaller size for smaller sheds. Our shed accessories like the large flower box look great with our bigger shed sizes like the 10x12 Gable Shed or the 10x12 Gambrel Shed. Beautify your new sheds with our collection of shed accessories!